When mankind is long gone, popular wisdom has it that the cockroaches will survive and inherit the Earth. Not so according to the Pugmire Fantasy Tabletop Roleplaying Game. In the far future, long after an apocalypse that led to the disappearance of Man, it is his best friend that inherits the Earth. That is, dogs! Long uplifted to use tools, read, and improve the world around them, dogs have founded the Kingdom of Pugmire and now strive to live up to the ideals of their long-gone masters—the Code of Man. These are Be a Good Dog, Obey the Master, Bite only those who endanger you, Defend your home, Stay loyal to those that are true, Protect all from the Unseen, and Fetch what has been left behind. Currently, the Kingdom of Pugmire is roughly equal to a medieval world, but Mankind also left behind caches and troves of ‘magical’ artefacts which the dogs constantly search for. After all, the fact that dogs can use them is surely a sign of Man’s faith in them. Of course, Dogs are not the only species to have been uplifted by Man or the Old Ones. Only decades ago, the Kingdom of Pugmire fought a war against the Monarchies of Mau—a confederation of Cats, whilst tribes of Badgers, Rats, and Lizards can be found inside and outside of the kingdom’s borders. Indeed, the Monarchies of Mau is the subject of its own roleplaying game. Besides sharing a setting, Monarchies of Mau and Pugmire both have the facts in common that they were funded via Kickstarter and both are published by Onyx Path Publishing. Dogs in Pugmire have a Calling, a Breed, and a Background. A Calling is what a Dog does and is the equivalent of a Class. Six are given—Artisans (Wizards), Guardians (Fighters), Hunters (Rangers), Ratters (Rogues), Shepherds (Clerics), and Strays (Barbarians). Notable of these are the Artisan and Shepherd Callings. The Artisan specialises in the use of artefacts for magical effects, whilst the Shepherd belongs to the Church of Man, both spreads and uses the word of the Code of Man to guide others, and generally espouses being a good dog. A Breed is essentially a Dog’s Race. These are grouped into six types—Companion, Fettle, Herders, Pointers, Runners, and Workers, plus Mutts. The Breeds are more generalised than specific breeds of dog, but within each Breed there are several notable families, such as the Pug for Companions, Corgis for Herders, Greyhounds for Runners, and so on, which more correspond to the specific breeds of today. This neatly avoids Pugmire having to detail each and every contemporary breed and also establishes the various noble families within the kingdom. A Background is what a Dog did before becoming a hero and answering his Calling. Just eight are given, ranging from Acolyte and Common Folk to Sage and Soldier. A Dog’s Calling will provide him with a view on other Callings, on the Code of Man—each Calling favours a different part of the Code, his Stamina Points, skills and rucksack (equipment), plus his first Tricks. The latter are of course, a Dog’s special abilities and powers and are akin to the proficiencies or feats of Dungeons & Dragons. More skills, rucksack contents, and another Trick will come from a Dog’s Background, whilst his Breed provides another Trick and an Ability (attribute) bonus. Running through the Callings ad the Breeds is the ‘Rule of Six’, lists of six aspects about the Breed or Calling. So there are six families per Breed and six views on the other Callings, six Calling types, and six unusual circumstances by which a Dog acquired something in his rucksack. Creating a Dog involves selecting a Calling, a Breed, and a Background, plus skills and Tricks. Artisans and Shepherds also have spells. Unlike in other roleplaying games, the core abilities are not rolled for, but assigned from a given set of values. The creation process is generally straightforward and a player is nicely guided through the process, step-by-step. Our sample character is Rupert Dachshund, an Artisan Pointer who has recently finished his apprenticeship to his uncle who owns and runs the family business, Object d’artefact, which trades in, and auctions, artefacts. He also sends out packs of adventurers to search for and recover artefacts. Now that Rupert Dachshund has completed his training, he wants to see more than just artefacts under glass, being evaluated, or going under the hammer. He wants to see artefacts in the wild! He wants some experience and perhaps he might even join the Royal Pioneers. Given its Dungeons & Dragons-derived mechanics, it should be no surprise that Pugmire is Class and Level system. Unlike Dungeons & Dragons, the Levels only go up to Tenth Level, at which point a Dog is considered an Old Dog and cannot advance any further, although he can still go adventuring. Unlike Dungeons & Dragons, a Dog who goes adventuring in Pugmire does not earn Experience Points, but is awarded a new Level after a few good stories and when the Guide—as the Game Master is known in Pugmire—decides is appropriate. When he does go up a Level, a Dog gains both Stamina and Stamina dice, spellcasters—Artisans and Shepherds gain more spells and spell slots, and at every other Level, a Dog’s Proficiency Bonus increases. Every Level, a Dog gains an Improvement, which can be to improve an Ability score; take a new Calling, Breeding, or Aptitude Trick; or refine an existing Calling or Masterwork Trick. The latter is possible because beyond the basic effect of a Trick, it can be refined or upgraded. For example, Focus Magic is a Calling Trick for the Artisan which allows a Dog to cast spells via a focus. One refinement allows the Artisan to select four more spells from the spell levels that he knows, whilst the other enables him to choose spells from the next spell level. The Archery Trick for the Hunter Calling gives a Dog a bonus on ranged attacks, whilst refinements can give him the Advantage on ammunition saving throws, allow him a bonus attack on the same target, and reroll damage rolls if a one is rolled. These tweaks and refinements give Pugmire a sense of the cinematic and heroic action as well as providing some variability in terms of Dog design. Mechanically, Pugmire looks much like Dungeons & Dragons, Fifth Edition, but on a closer look, there are tweaks and refinements to the rules too. The most notable addition is that of Fortune and the Fortune Bowl. A session begins with the Dogs in an adventuring party having two Fortune in the Fortune Bowl. A player can earn more Fortune for the Bowl by roleplaying to his Dog’s personality traits in a way that makes the game interesting, by being an entertaining player, coming up with a good plan, and by playing a ‘Good Dog’. Much of this is up to the discretion of the Guide, but a player can force the Guide to add Fortune to the Bowl by having his Dog intentionally fail. Fortune in the Bowl can be spent—and this is a permanent spend—to gain a reroll on any dice roll and keep the higher result, to allow a spellcaster to cast a spell if he has run out of spell slots, and to interrupt the initiative order and take their turn now. Further, some Tricks require Fortune to be activated, for example, ‘Nearby Expert’, a Background Trick, allows a player to spend Fortune for his Dog to know someone close by who has the knowledge or expertise that his Dog needs. Again, magic in Pugmire looks like Dungeons & Dragons, but with a tweak or two. One is a matter of flavour or two, which has a canine cast to it. So, Magic Paw instead of Mage Hand, Smell Magic instead of Detect Magic, and so on. Basic spells like this—there are three each for both the Artisan and the Shepherd, can be cast freely by a Dog of the correct Calling. Spells of Level One and above cost a caster Slots to cast, equal to the Level of the spells. Thus, one Slot for a Level One spell, two Slots for a Level Two spell, all the way up to Level Five. Fitter Artisans and Shepherds—those with a higher Constitution—have more Slots. What this means is that a spellcaster is free to cast what he wants and however many times he wants as long as he has Slots left. The setting for the roleplaying game is Pugmire, both a kingdom and a small city, the latter built around a castle and on what was once swampland. The kingdom is currently ruled by King Puckington Pug with the support of the Church of Man and dominated by great breeds and families who each own an ancient relic as indication of their nobility. One relic of Man is used as currency in the kingdom—plastic! It is literally dug from the ground and melted into coins. It is also useful in the construction of the plastic hulls needed for any ship wanting to sail the Acid Sea, although the kingdom’s access to the sea is limited. The kingdom maintains a testy relationship with the Monarchies of Mau; dislike the Rats—which include Rats and Mice—as they covet the same relics or ‘shinies’; and hate the Badgers—which include Otters, Polecats, Weasels, Ferrets, and Wolverines, as well as Badgers—for the raids they carry out on the kingdom and relic caches. The nomadic Lizards are tolerated for the stories and goods from foreign lands they trade in. Within the kingdom, the Royal Pioneers of Pugmire is an organisation of adventurers, whose members are Pugmire citizens—so it accepts strays, criminals, and bandits—and who are dedicated to protecting the kingdom, recovering relics, and uncovering knowledge. It is organised into parties who report to and are assigned tasks by a trustee. One of the benefits of being a Pioneer is that a Dog gets to keep and use whatever relics he recovers. Essentially, the Royal Pioneers of Pugmire is the default organisation for the player characters or Dogs to join and serve in, and so go adventuring. One of the reasons that the Dogs are adventuring is relics. These include items which Dogs call ‘Masterworks’; consumable oils, dusts, and potions they call ‘Fixes’; and bizarre items such as a Bowl of Endless Water or the Ticking Rose, they call ‘Wonders’. From the Amulet of Health and the Bag of Holding to the Ring of Resistance and Robe of Scintillating Colours, these do look standard magical items a la Dungeons & Dragons. Yet Pugmire being a post-apocalyptic world, what they really are, is items of Old World technology. Some of the items are easy to map back onto items of contemporary technology, for example, a Lantern of Revealing could be some kind of scanner, Boots of Silence actually rubber-soled shoes, and a Potion of Heroism, some kind of drug. Others though are less obvious and may take some imagination to determine. A Dog does not just own a relic. In the case of some Masterworks, a Dog not only has to attune himself to an item, he can also refine it with an improvement when he acquires a new Level. So the Gauntlets of Power raises a wearer’s Strength to 20 instead of 18 if attuned and refined and a Ring of Protection provides a +1 bonus to Defence and saving throws, but can be refined twice to increase the bonus for each to +2. The list of Masterworks, Fixes, and Wonders is limited, but beyond Pugmire, the number of magical items and sourcebooks thereof for the various iterations of Dungeons & Dragons is all but inexhaustible. Like its treatment of magical items, Pugmire presents its monsters and enemies in a different fashion. There are of course other animals—Dogs, Cats, Rats, Badgers, and Lizards, but these are joined by more traditional monsters like Giant Ants and Zombies as well as some quite odd particular to the world of Pugmire. This includes the Kapatapa, a metallic thing with wheels which drags unaware Dogs into rivers and lakes it hides in; the Two-Headed Giant, which has the head of a Dog and the head of a Cat, which argue with each other, but hate their parent species; and the Mementomorian, a Dog-like creature which constantly harvests the memories of Dogs dead in the graveyard and on the battlefield. The most interesting monsters in Pugmire are the demons. They are also the most terrifying, for they are the demons of the Unseen, the demons that only Dogs can see and the demons that the Dogs warned Man about. Which of course Man took no heed of, for Dogs can only bark. Which is a lovely conceit. For the Guide there is a well written chapter of advice and suggestions for running Pugmire. This covers everything from hosting the game to running it and more, including helping with character generation, being a storyteller and pacing scenes, handling the rules and creating a Chronicle—a campaign, ideas for Chronicle types other than the Royal Pioneers of Pugmire, and even suggestions for other game systems that the setting of Pugmire could be run under. Rounding out Pugmire is a short adventure, ‘The Great Cat Conspiracy’. Designed for beginning characters, in which the Dogs are hired by the Doberman family to rid its iron mines the cat bandits which have raiding them. Involving a good mix of social interaction, wilderness adventure, and dungeoneering, the scenario is a fairly straightforward affair. It nicely introduces the players to the setting and its social mores as well as giving them a good taste of the mechanics. One aspect where Pugmire definitely differs from Dungeons & Dragons is that of Alignment. In Dungeon & Dragons there are various Alignments or ethical and moral outlooks on life, such Lawful Good, Neutral, and Chaotic Evil. Pugmire does not have such varied outlooks or Alignments and it is in fact much more like the Code of Bushido in Legend of the Five Rings. In the setting of that roleplaying game, Rokugan, every samurai believes in the Code of Bushido, but each clan values a different tenet of the code more highly over the others. So it is with the Callings in Pugmire, and thus in effect, what you have is the single Alignment, but with variations. That said, the approach to the Code of Man, although important to just about every Dog is not as earnest as that of a samurai to Bushido—unless of course you are devout worshipper of the Church of Man. 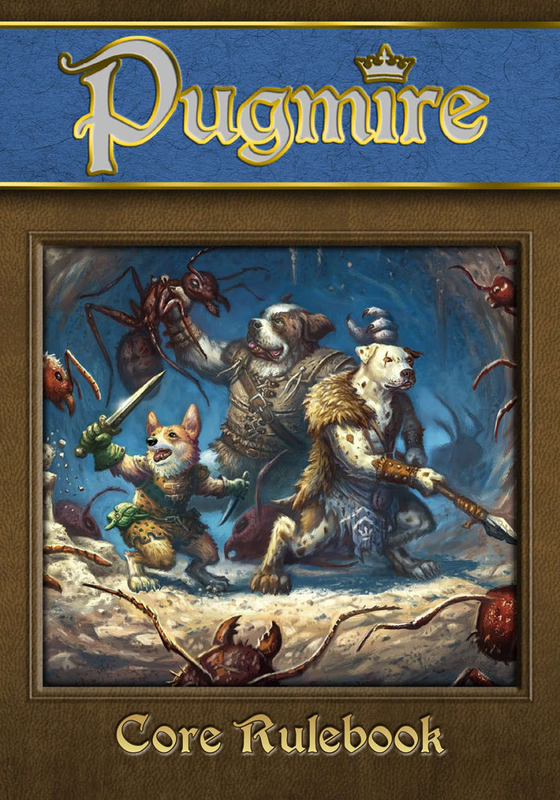 In embracing the Code of Man, Pugmire is positive roleplaying game about bettering the lives of every Dog and safeguarding the kingdom, if not making it better for your pups. It is about doing this together, since Dogs are pack animals and like to work together. What this means is that Pugmire is not really a game about the divisive individual. As written, there is no element in Pugmire of, “I can do anything I want, so my character is going to go off and do this—and screw you!” as was in your early games of Dungeons & Dragons. This is not say that there is or was this element in Dungeons & Dragons necessarily—but again, remember that game back in the day where the Thief betrayed you, stole all of your loot, and got you all killed?—and it is not to say that this could not happen in Pugmire, but rather that Pugmire makes it implicit that it is game of cooperation and working together. Of course, being a post-apocalyptic fantasy game, Pugmire is also a game of exploration and mystery. Exploration because the kingdom does not know what lies beyond its borders and mystery because who knows what lies out there and who knows what happened to Man? Physically, Pugmire Fantasy Tabletop Roleplaying Game is a lovely book. The slightly undersized hardback is done in full colour and the artwork is absolutely great. If you want pictures of Dogs in medieval armour and wielding swords and fighting monsters, then this book is perfect for you. A slight edit is needed here and there, but the writing is light and engaging, with the rules being very well explained. One nice touch is the inclusion of advice in separate boxes, both from characters within the setting. One provides further explanation, whilst the other gives advanced options. As much as it employs the mechanics of Dungeons & Dragons, Fifth Edition, what Pugmire is not, ‘Dungeons & Dragons with Dogs’. One reason is the (fantasy in a) post-apocalyptic setting, but really it is the positive nature of the character or Dog design and their embracing of the Code of Man and the cooperative style of play that it encourages which pulls it away from Dungeons & Dragons. One thing Pugmire is not, is an introductory roleplaying game. As well written as it is, it is perhaps a bit too dense a book to serve as that. One element that it does lack to that end, is an example of play. On the downside of course, you almost wish that Pugmire had been written as an introductory roleplaying game, perhaps a boxed set. (In fact, it would be nice to see an introductory boxed set written using the same mechanics and in the same tone as Pugmire, but perhaps with three different settings a la Chaosium’s Worlds of Wonder roleplaying game.) Now what Pugmire works better as, is a first roleplaying game, a roleplaying game that the Guide can run for others who are new to roleplaying, whether they are younger players or adults. For either age, both the tone and the setting of the game are positive and inclusive, and the idea of playing anthropomorphic Dogs is fun and engaging, which is refreshing and something that more experienced players are likely to enjoy too. Inspired by his own dog—the late and much-loved Pug, Murray—the author of Pugmire Fantasy Tabletop Roleplaying Game brings a canine cast to roleplaying fantasy and does so in a well written, beautifully presented, and engaging fashion. Pugmire is the roleplaying game for Good Dogs everywhere.